That is the magic ‘word’!! No matter who you are, you need money to survive in this world. Money may not buy happiness literally, but it allows you to afford food, water, shelter at the very least. Once you realize that making money is essential for basic survival, you can focus on how. Are you an ambitious person? Are you someone who likes being comfortable and stable? Maybe you want to work for a big company like Google or maybe you want to start something of your own. Of course, entrepreneurship isn’t for everybody, just like employment isn’t. For a long time, employment was the only choice, and starting something by yourself and being an entrepreneur was rather unconventional. However, entrepreneurship is now gaining popularity and has become one of the most talked about topics. 56% of Indians have considered leaving their current job and start their own business. Starting your own business comes with an independent decision-making capacity. You have an immense amount of freedom to tailor your work pattern according to your lifestyle. You get to choose where you work, when you work and who you work with. You don’t answer to a boss, you make your own decisions, also regarding the way you work. Since you are your own boss, you have the freedom to decide when you work and when you stop. Though you might have to put in longer hours, you aren’t bound to strict 9-5 work hours. Whether you prefer a steady, fixed schedule or wish to have more flexibility with your work hours, you’re the one who creates your schedule. An entrepreneur usually has to simultaneously play many roles – that of a marketer, HR, customer service, company strategist and more. These roles come with the opportunity to learn and explore new situations. Meeting other like-minded entrepreneurs, facing business challenges and networking help you with your growth and lead to greater opportunities. 83% of Indians would love to be an entrepreneur because it gives them more opportunities. As an entrepreneur, your earning capacities are endless. You are fully in charge of the money you bring in, as well as, the rate of growth of your business. A change in your business strategy or addition of a new product could lead to increased earnings. Sky is the limit when you own your business. 76% of Indians would love to be an entrepreneur, but to them, the risk of failure is too big. Being an entrepreneur will probably be the biggest challenge you face in your life as entrepreneurs tend to take risks every day. You’re responsible for everything from the finances, to marketing and getting clientele. One wrong decision can put the business at risk, sometimes even of losing money. When you’re self-employed, your income can vary considerably from month to month. When you work for yourself, the lines between your professional and personal life can get blurred. Some businesses need to work for a number of hours in order to get off the ground and be successful. You, as an entrepreneur, are required to put in a lot more hours than an employee for your business to succeed. It isn’t a 9 to 5 job, it is non-stop. For you to even have a fighting chance, you have to be ready to sacrifice everything, even your personal life. Startups are irregular and that may never change. With no guaranteed income, no boss for guidance, no colleagues for support and challenges to be faced everyday, entrepreneurship can be a stressful and feel like a lonely battle. Capital is one of the main things an entrepreneur needs to keep the entrepreneurial dream alive but unfortunately, it is not that easy to come by. Banks are reluctant to give loans to businesses they don’t know about and you may have to put in a significant amount of investment yourself. This investment can have a huge impact on performance and can lead to debt. On the other hand, being a part of a big company is like being a small part of a well-oiled machine. 84% of Indians prefer to work for a multinational company as it provides more stability. A huge advantage of a job over business is guaranteed income. A corporate job offers steady pay without having to worry about profits and losses of the company. This assurance of a regular income provides a level of financial security which you may not have as an entrepreneur. Being an employee means you get insurance, paid off-days or holidays and retirement plans. It provides stability and safety for you and your family. You may take a holiday or choose to work on your personal relationships, hobbies, exercise, or simply rest. These off-days or holidays can give employees much-needed breaks to refresh themselves so they can work better. You are responsible only for your share of the work but it is to be done to perfection. You don’t need to worry about how other people are performing across the company, as you will still receive your payment as long as you complete all the tasks that are outlined and expected of you in your individual role. When you clock out from your job, you can go home and forget about your work. Being able to put a dedicated amount of time to your work helps you compartmentalize your work and home life. This is important as it equates to less stress and helps you concentrate better. Being an employee also means following your employer’s instructions and becoming dependent on them for your next paycheck. You might work hard towards gaining a promotion and in the end, the boss chooses to promote somebody else. While you might have control over your job security, financial decisions are completely out of your control. Your annual income as an employee is pre-determined by the terms of your employment contract. The salary for employees rarely increases than the pre-decided amount when you’re joining a company. There are possibilities of promotions or bonuses but those too are capped or limited. The constraints of a specific industry or assigned role can minimize your scope of development. Employees have fewer options to advance and can only do so within a specific industry. Jobs are not always guaranteed for life and employers can let you go without providing a solid reason. This, however, does depend on the contract of employment. But, job security is not 100%. 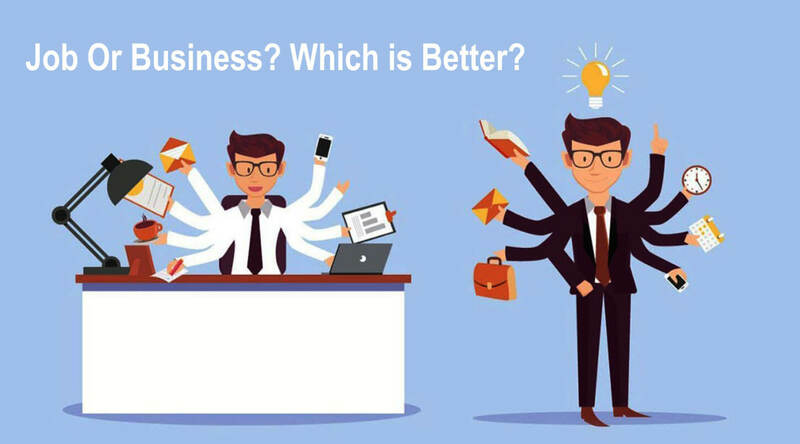 Entrepreneurs and employees are both important to the world, so if you want to start a new business or work for an already established one, you are still valuable to the society. You do not need to label yourself or fit into any predefined role in order to find happiness. No matter where you are in life, you can always change career paths.